Wow! Zero to Sixty in record time! End last week with cool 70’s and gentle rains begin this week with 95 degrees and heavy thunderstorms. I would say that summer has come. It is all about blueberries now. We have a crew of up to eight trying to keep up with the fast ripening fruit, to no avail. I tell them don’t look back at where you just picked as it could be depressing. We put flags, in the row, to mark where we stopped picking so we will know where to start the next morning because you absolutely cannot tell otherwise. 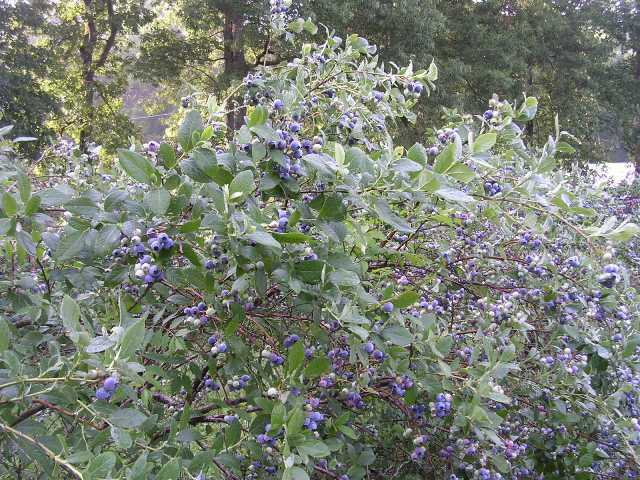 It is always enjoyable and interesting in the blueberry field. First it is the most comfortable job on the farm, standing up, usually a breeze across the hill and the birds just singing away in the trees (happy with all of the blueberries they have eaten). Secondly the crew is always an eclectic group. My usual staff which includes Joann and Rett, farmers on their own places, Rachel a college student in geography, Julia who recently graduated college from Nova Scotia, plays hockey and directs Shakespearean plays. We always have a few returning pickers like Brenda who is taking a hiatus from farming in Illinois this year. Then we round it out with a few new faces like Max from Texas who is searching for the right place to start his own farm and then a couple of high school students. The conversation is always wide ranging and I am never quite sure who is more scandalized, the older ones or the younger ones! Betsy and I almost never get into the berries as we scamper around trying to put our fingers in all of the other holes in the dike of Peregrine Farm. This is the true change of seasons as we begin to take out irrigation and mow down the finished cool season crops. There is only one bed of lettuce left in the field, which is now almost entirely changed over to flowers- sunflowers, zinnias, celosia, asters and more. The rest of the cool season vegetables will soon go under the mower to be followed with more flowers, what will eventually be the last of the year. The larkspur, first sunflowers, bachelors buttons, etc. will turn into lush cover crops of sorghum and soybeans to improve the soil and feed and shade the turkeys when they get in there in two months or so. It all happens this few weeks in mid June. I also managed to get the first layer of trellising in the first eight beds of peppers including all of the hots. Last year we waited 48 hours too long to get this job done and they were all blown over by a huge storm, never to fully recover for the rest of the season. Last night as the thunder was rumbling just over the hill I put the last strings on. With in an hour the heavy rains came and they stand straight and proud now. Joann seeded the Brussels Sprouts and Celery for Thanksgiving, that is a true sign of seasonal change! I swing through the berry field every so often to check on the progress and quality, partake briefly in the conversation and grab a hand full of fruit and head back off to what ever chore I am in the middle of.